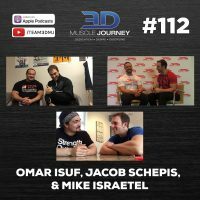 In this episode, Eric Helms interviews Omar Isuf, Jacob Schepis, and Dr. Mike Israetel. One by one, Eric asks each of the guests to share some of their most valuable anecdotes and observations since beginning their careers in the fitness industry. To kick off the episode, Omar and Eric discuss the importance of helping your clients to identify their motives and the impact this has on their long-term success. Following Omar and Eric’s conversation, Jacob and Eric dive into the necessity of focusing on each client as a unique individual and the role standardized systems play in allowing a trainer/coach to efficiently and effectively assist their clients. Finally, Mike and Eric break down the method that Mike uses to help athletes identify the amount of volume they need to progress. Whether you are a competitive athlete, noncompetitive lifter, coach, or trainer, this episode has ideas, tools, and strategies you can use to help you more effectively train yourself and/or your clients.